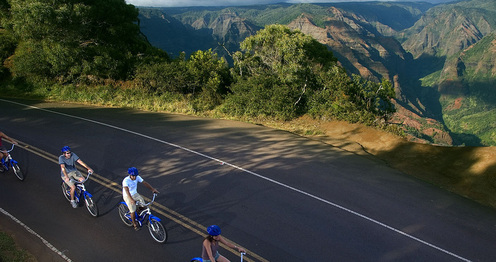 Waimea Canyon is commonly referred to as the mini Grand Canyon of the Pacific. See it all up-close as you coast along on this half-day ride all downhill begining at 3,600 feet. These dramatic canyon cliffs offer the best views you can get! 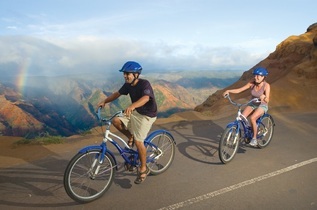 You'll experience the climate changes Kauai is famous for as you decend toward the dazzling Pacific Ocean. Lookouts all along the way offer so many different amazing views. 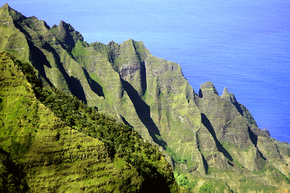 You'll enjoy refreshments as your guide shares information about the culture, foklore and history, of Kauai. Your bike is a single-speed cruiser with a wide comfy seat, high-rise handlebars and disc brakes which makes for a fun and easy to ride. Where/When: In Poi Pu. M/W/F Check in: 6:00am/2:30pm. Sundays 6:00am only. Tours are 4-4.5 hours. Wear/Bring: Dress in layers, bring a windbreaker or a light rain coat and wear closed toed shoes and sunglasses. Includes: Bikes, helmets, snacks and beverages. Important Information: Weight limit is 275 lbs. No bike riders under 12 years of age. All riders must be able to pass a basic bike test. Youth riders must be accompanied by an adult.